Does Private Sector Debt matter? According to neo-classical economics, debt is irrelevant. One man's debt is another man's credit and the two cancel out. Even prominent Keynesians, for example Paul Krugman, appear to argue somewhat along these lines. However, the events of 2008 were something of a wake-up call for those who have ignored the dynamics of debt. 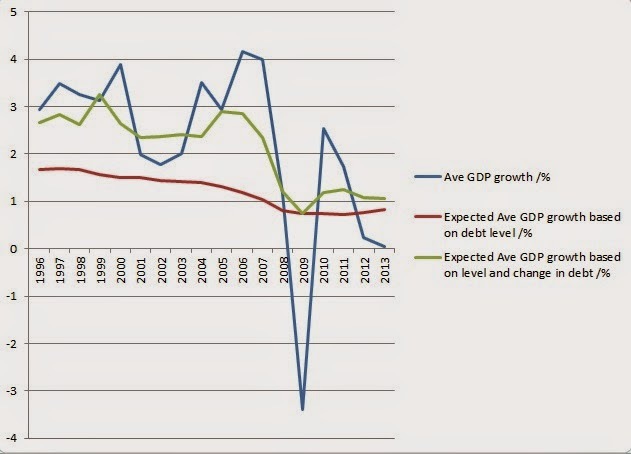 In this blog post I discuss what, if corroborated by others, is, in my opinion, a very significant finding about how private sector debt affects GDP. It quantifies the positive and negative effects of private debt on GDP growth. There are three main reasons why high private sector debt levels are important. The act of lending tends to transfer principal from people with a low propensity to spend (savers) to people with a higher propensity to spend (borrowers or house sellers). As George Cooper argues, this could also be seen as broadly a transfer from rich to poor. This boosts GDP at the time of creation. Then, the paying back of interest and principal reverses this transfer in the future, shifting money from those with a higher to those with a lower propensity to spend. This leads to a future decrease in GDP. Increased debt levels lead to increased financial instability. Steve Keen and other Post-Keynesians explain this better than many conventional economists. Often increased debt leads to higher asset prices which encourages greater risk taking and this starts a positive feedback loop. A boom and bust cycle is destructive for long term growth. Borrowers may not to be able to pay the debt back, but lenders, especially if they have lent their money to a bank, do indeed expect to be paid back. Because of this, often the government, and thus the whole of society, has to foot the bill. If it gets too high, private debt becomes public debt eventually. Debt is not just a shuffling around of money that already exists. As this Bank of England publication explains, it is an increase in the money supply - making the total savings of the country higher. There is theoretically no limit on the money creation power of private banks. And they have created a lot. The hugely increasing money supply of the last 30 years may in fact be partly responsible for the low interest rates at the moment; unless there is a commensurate increase in productivity then there are more savings between which to share the same total economic return. A perhaps more substantial contributor, though, is the low trend growth. In fact I would argue that the 'secular stagnation' that has recently been discussed by Larry Summers and Ben Bernanke can be largely attributed to the private sector debt overhang. I will later show that if, for example through a bout of hyper-inflation, the debt could be wiped out, we could expect trend growth of over 3.5%. As it stands, the US and UK, with around 200% of GDP each in private sector debt, are potentially losing almost 3% of growth per year. This may well be an overestimate as, for one thing, it is difficult to say what happens at debt levels below 100% (as no country has a debt level that low), but it also may not be. An upper bound for the positive impact on the GDP of increase in private sector debt. The longer term cost to GDP growth of an increased level of private sector debt. This is extremely significant for a number of policy reasons. An important one being the costs of government austerity. The popular misconception that governments, like households, should live within their means is a very dangerous one. The costs are often hidden. Many economists, including the excellent Simon Wren Lewis, make an compelling case about the dangers of austerity when an economy is running at under capacity. I feel that these arguments are broadly correct, however I intend to approach from a slightly different angle. When making economic policy there are two main tools at the disposal of the policy makers - fiscal and monetary. When a government decides not to increase spending in a recession, then in order to increase demand to an acceptable level monetary policy must be used. The state of the economy necessitates that central bankers reduce interest rates and this works to boost the economy by encouraging private sector borrowing. My argument, based on the data below, is that this is an inefficient way of boosting the economy because the long term costs are too high. This is both because of the toll it takes on future GDP growth and because eventually the government may well have to pay the bill. And because of the inefficiency as a way of boosting growth, this bill will be much higher than the original savings of austerity. The reason that I am trying to get an upper bound for the positive GDP impact of increased private sector debt is because I want to argue that, even given the highest possible estimate for the multiplier of private debt to increase in GDP, it is still an inefficient way to boost the economy. The estimate of the long term cost to GDP growth of higher levels of private debt is a pretty fair estimate in my opinion, although I am open to arguments to the contrary. I will begin with a quantification and a discussion of the policy implications. A more detailed methodology follows this. Data used are available on request (although they are also on the OECD website). How much Does Private Sector Debt Matter? In order to isolate the significance of private debt levels and change thereof, I took OECD data from 28 major economies over the period 1995 to the present. For each country-year GDP growth I found the corresponding a) debt level and b) change over the year. I regressed the data. The results are pretty much the same either for household, non-financial sector debt or the combination. A 10% of GDP increase in private sector debt is associated with at most a 0.97% increase in GDP for that country for that year. Here, a 10% increase in the ratio of total private debt to GDP is associated with a 0.14% decrease in GDP growth for that country for every year going forwards. I find this result to be extremely important. I would like to see if someone else can find a result that contradicts this because the policy implications of this are really immense. I show below a graph of the overall effect on world economic growth of the increase in debt, based on the results for all of the individual country data points. The blue line shows mean GDP growth for the countries in the OECD list. The red line shows how expected growth has been affected by a global increase in private sector debt to GDP. One can see that the potential level of annual GDP growth has been reduced by 0.85 percentage points. This is obviously huge. it is somewhat depressing as it suggests that since the 1990s the only way we have been buying greater than 2% growth is with credit and this has taken a long term toll. The good news is that, as mentioned above, given a massive bout of inflation that sets private debt back to zero, the model suggests that we could expect growth rates of over 3.5%. 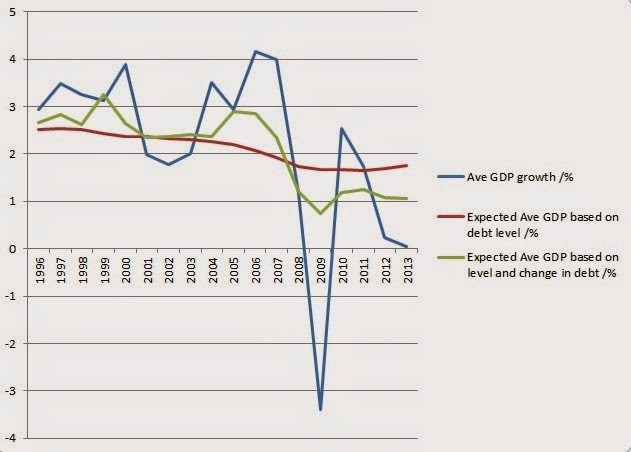 The green line makes a prediction for average GDP growth which into account both the level of debt and the change in debt in a given year. It can be seen that the positive impact of increased private debt has been slowly counteracted by the negative impact. But in an attempt to keep the economic growth at the previous level, more and more debt has been taken. And the more that is taken, the more that is needed. Please note: There is now an update to this post, based on a suggestion from Professor Steve Keen, which includes the second derivative of debt level in the regression. This negates my need for special treatment of 2009. Importantly it also enables me to give a long term cost to increased government borrowing which facilitates comparisons with private borrowing. I show that the cost of private sector debt is almost an order of magnitude higher than the cost of government debt. 1. 0.97% GDP growth can be bought with either 10% increase in private sector debt or a much smaller increase in government debt. To buy it with an increase in private sector debt costs 0.14% of GDP per year indefinitely (more accurately until GDP grows enough to render the extra debt insignificant). Now, it depends on where we are in the economic cycle, but assuming a multiplier of 50%, more growth than this can be bought with just 2% of government debt. This is currently serviceable at negative real rates in the UK. To reiterate, Government debt is far preferable to private debt as it is more efficient and less costly in future GDP to service. 2. Once again, I think that policy makers really need to consider ways to deleverage without costing growth. My favourite suggestion (as mentioned before) is that of Lord Adair Turner, to monetise government debt whilst raising rates. To increase demand with government spending whilst not increasing debt is a sensible path out of the stagnation we are in. 3. Inflation is absolutely necessary to reduce the private debt burden. Inflation reduces the private debt to GDP level and can reset the economy by taking away some of the previously discussed drag from private debt levels. Certainly the 2% BoE target should be being hit. More quantitative easing is probably necessary here. I have taken OECD data, which is incomplete, but has most of the debt-to GDP and GDP data for major economies going back to 1995. The debt data can be separated out into government, private (non-financial plus household), non-financial and financial sector debt. I have looked at the private sector debt, separating it into non-financial sector and household and also looking at the private sector as a whole. In total I have around 450 data points for each - by which I mean independent country years of GDP growth for which I have both of the following: 1) amount of extra private sector debt created in the past year 2) total level of private sector debt to GDP. I regress the GDP growth against the two variables - a) level and b) change in private sector debt, With 450 data points and just two explanatory variables, the results are quite robust. I get virtually the same results whether looking at household debt or non-financial sector debt (or the combination of the two). 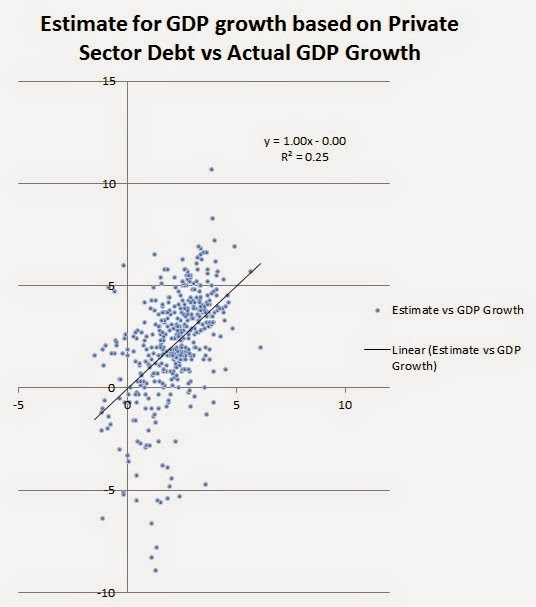 As shown in the scatter plot above, the knowledge of the two pieces of data a) level of private debt and b) change in private debt, can be used to make a prediction for the GDP growth. But correlation does not equal causation. Is there a reason why a high level of private sector debt should be associated with a slower GDP growth if it does not cause it? I can't think of one. A high level of private debt may be more likely after a downturn, but this does not mean growth can not bounce back. I think that any relationship here is likely to be causal. Is there a reason why change in private sector debt may be correlated to GDP growth but not cause it? Yes - maybe the GDP growth encourages the increase in private sector debt. However, as mentioned before, I am looking for an upper bound so I am going to assume that all growth related to the change in private debt is actually caused by it. This is the most conservative assumption I can make here. I have also ignored 2009 from my coefficient estimation because in this time an increase in debt was forced by the crisis. This would reduce the coefficient here if I included it, but again I am looking for an upper bound. The results shown above are the regression coefficients. All other things being equal, a country with 200% private debt to GDP (eg the UK or US) would expect to have 1.4% lower GDP than one with 100% private sector debt to GDP. A country which increases private debt by 10% of the previous year's GDP would expect 0.97% more growth than a country which has not increased private debt. Some other minor points - I have excluded some tiny economies, for example Estonia and Iceland, as they are atypical. I have looked at both debt level at the end of the year and the beginning of the year and the results are more or less the same. I would be very interested in hearing if someone were to conduct a study on other data which either corroborates or refutes this idea.